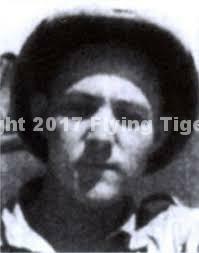 Pre AVG: After graduating from high school and attending Chicago Aeronautical University, Losonsky entered the U.S. Army Air Corps in 1939. While stationed at Selfridge Field, in May of 1941, he was intrigued by the opportunity for adventure that was offered by the AVG recruiters and soon found himself on a ship headed for Burma and China. AVG Service: Losonsky was assigned as a Crew Chief in the “Hell’s Angels” squadron where he generally was responsible for 3 to 4 aircraft at a time. In addition to these duties, he also was called upon to carry out memorable tasks such as delivering bombs via truck from Kunming to Paoshan, and salvaging parts from ill-fated P-40’s. On one such occasion, Losonsky was part of a salvage crew sent out to recover 4 wrecked Tomahawks. All four of the planes, led by Gregory “Pappy” Boyington, had made forced landings near the Indochina border. Honorably discharged from the AVG, Frank returned home, married, and then returned to the Far East as a mechanic with Chinese National Aviation Corporation (CNAC). Later, he returned stateside and assisted in building B-24 Liberators. Leaving the Air Corps, Losonsky took a civil service job at Clark Field in the Philipines. Losonsky soon found himself on the ground floor of the new TransAsiatic Airlines which flew the Manila, Hong Kong, Bangkok, Rangoon route. He attained one of his earliest goals and became a commercial pilot. In 1950, he left TAA. After a short time farming in Michigan, Losonsky joined the Allison Division of General Motors as a jet engine service engineer. He spent the next 30 years with GM, traveling all over the world as Allison’s service representative. After retiring from GM, Frank joined his son’s Part IV Columbus, Georgia, restaurant conglomeration as an Executive Officer.